The Great Day, Inc. Load Lite Aluminum Loading Ramp LL21643 is ideal for loading and unloading a Zero Turn Lawnmower or UTV onto a trailer with out a tailgate. The weight of most UTVs and electric-powered carts require a loading ramp with a lot of holding power. UTV ramp has to hold a lot of weight and provide a good flooring design and loading space. Loading a Zero Turn Mower can also be a challenge. Use both panels to load UTVs and electric carts or use a single panel to load motorcycles weighing up to 1800 lbs. Solid landscaping equipment lets you move dirt, gravel, sand, snow and mulch with little effort. This 38-inch Box Scraper's scarifier bar allows you to move material and easily level it, plus its centre-mounted, square channel frame means this tool will last for generations. Arm yourself with this 40-inch Dethatcher from Brinly to prevent roots, leaves, grass clippings and other small vegetation from inhibiting the growth of your lawn. The 20 flexing, dual-tine tips comb the matted layer of thatch, which creates lawn disease and inhibits water and nutrients from seeping down to the roots. Once the thatch is loosened it can be easily bagged for disposal. The dethatcher's 40-inch working width tackles large areas of grass, ideal for when you need to finish the job in a hurry. 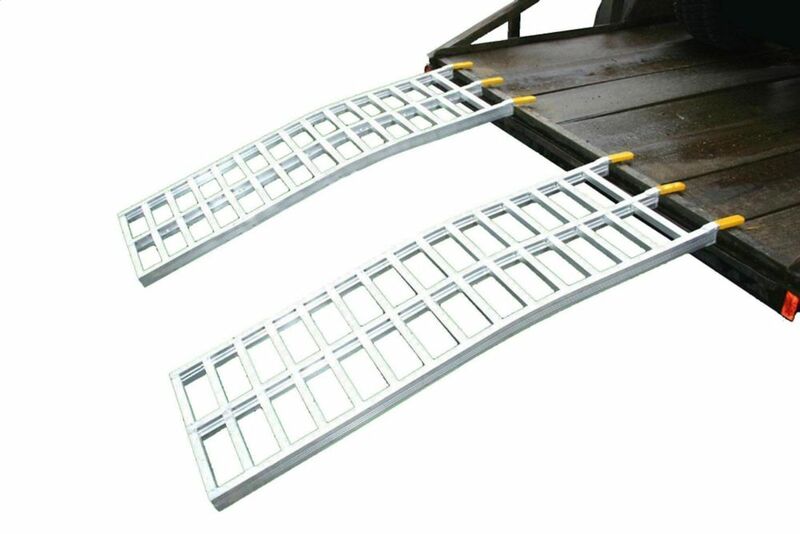 UTV/Zero Turn Ramp The Great Day, Inc. Load Lite Aluminum Loading Ramp LL21643 is ideal for loading and unloading a Zero Turn Lawnmower or UTV onto a trailer with out a tailgate. The weight of most UTVs and electric-powered carts require a loading ramp with a lot of holding power. UTV ramp has to hold a lot of weight and provide a good flooring design and loading space. Loading a Zero Turn Mower can also be a challenge. Use both panels to load UTVs and electric carts or use a single panel to load motorcycles weighing up to 1800 lbs. UTV/Zero Turn Ramp is rated 5.0 out of 5 by 4. Rated 5 out of 5 by knapper from A little pricey, but an excellent product. My primary concern in a loading ramp product was safety. These ramps excell in that category; they are very strudy and well manfactured.. They are light in weight and easy to carry around when loading and unloading. I am completely satisfied and highly reccomend this product. Rated 5 out of 5 by Bruce from Not used in normal fashion. Purchased because of weight bearing strength - 3000lbs. Sole intended use is to span a small creek that cuts off a portion of my property from gaining access to with a mower. Rated 5 out of 5 by JamesB from ZERO TURN RAMPS Excellent fit for my 48" wide trailer, the welded spacers works very well for driving on and off. The strengh so far is comfortable with the 210 pound body weight and the 640lb. mower, Great support . Thank you HOME DEPOT for matching a good supplier. Rated 5 out of 5 by DUDE from PRODUCT WORKS FINE PRODUCT WORKS FINE. ALTHOUGH A LITTLE PRICEY IT WAS WHAT I NEEDED AND WANTED.